Each surgical procedure we offer can be applied separately or they can be combined to give you the best possible cosmetic result. Remember that the goal of facial cosmetic surgery is improvement, not perfection. The facelift surgery diminishes jowls and improves neck contour. It does not restore your appearance of 20 years ago when the elasticity of your skin was tighter. 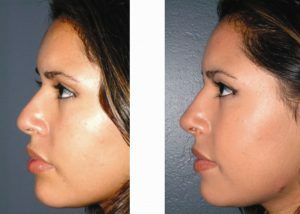 The same concept occurs in rhinoplasty where the goal is improvement not perfection. Each of my patients heal at a different rate and with different healing processes, thus all patients heal differently even if they have had the same operation(s). Revisional Surgery is more complex to perform as there has been scarring and changes under the skin. If you can, bring your preoperative photos or snapshots as well as the operative notes from the previous surgeon. This will help in the assessment of your condition which will lead to an accurate understanding of what type of surgical changes are possible to get the best improvement. Some of the Anti-Aging Techniques can be considered as steps to slow the aging process. Skin care maintenance is important to keep your facial skin as health as possible. One of the most obvious signs of aging is the skin of the face that begins to sag. The cheeks seem to occur lower on the face, jowls begin to form around the mouth, and the neck loses much of its shape. During a facelift surgery, the skin and tissues are raised to a higher position and pulled taught, and extra skin is trimmed from the face. A facelift is comprised of three parts, which are the cheek mound, the jaw line, and the neck. The skin as well as underlying tissue are shifted to create a more youthful look that begins with the internal structure of the face. Additional procedures like liposuction and liposhaving will remove the fat in the droopy lower cheek. Recovery periods from a facelift differ from two weeks and on, depending on if the patient received other procedures, or required more extensive improvements. Many people are unaware that they can undergo a facelift surgery even before their skin begins to sag considerably. Early facelifts are performed as a means of maintaining a fresher appearance and avoiding more drastic changes that would otherwise take place in the future. Men and women alike are eligible for a facelift, granted they are in good physical health and have a practical understanding of the possible outcomes of this facial cosmetic surgery. The majority of facelift patients are aged in their forties to sixties, but there are instances where people in their seventies or eighties receive the surgery. Patients can undergo a facelift surgery in a hospital, surgical center, or a within a plastic surgeon’s surgical center that is accredited and deemed safe. In certain cases general anesthesia is the best option, but local anesthesia with sedation is more commonly used. A facelift can require several hours to perform. Most patients experience bruising, swelling, and sensitive skin. The skin may also feel as though it lacks in moisture and elasticity at first. Unpleasant physical sensations tend to occur on a lower level, though a prescription for pain medicine is available if necessary. The majority of the bruising will disappear in the three weeks following the facelift. Numbing sensations of the face will slowly fade as feeling returns in the time frame of a few weeks up to a few months. The head should remain elevated for a few days after the facelift procedure so swelling remains minimal. If drainage tubes are present, they will be removed one to two days after the facial cosmetic surgery, and five days post-operatively. Stitches can be taken out about five days following a facelift. Everyday activities including work may be resumed ten to fourteen days following this facial procedure, and makeup can be worn to cover lingering bruises. Physically demanding activities must be put on hold for two plus weeks to allow proper healing of the face following the facelift surgery. Patients should limit sun exposure for several months. Because complications are a possibility of all surgeries, a facelift is no different. Potential issues that can arise are bleeding, infection, difficulty healing, nerve damage, hematoma, unsymmetrical results, scarring in the excess, and a bad reaction to the anesthesia used for the surgery. Patients will often-present just concerns about the sagging excessive skin of the neck. Sometimes there’s a fat deposit under the chin which acts as a physical weight to stretch the skin further. Often, there are two cords that are present going down the anterior part of the neck. Always there seems to be excess of skin. In the older patient group, the skin can be very crépy. Treatment requires surgery and usually requires 10 days of downtime. If there is fat below the chin in the front of the neck, then liposuction is used to remove a significant amount of the fat without skeletonizing the neck. Sometimes there is fat under the jowl line that needs to be removed at the same time. This is usually done first during the surgical procedure. If the patient is young and there is not much fat, only liposuction is needed. However if there is excessive skin that will not shrink, then the skin tightening procedure has to be done. Dr. Ellis uses smart liposuction, which is a technique of using a laser on a rod that separates the skin from the fat but heats up the skin to cause it to shrink. The platysma muscle in the neck is then hold back and sutured with the permanent suture tightening the excessive skin. The incision is made behind the ear and then horizontally straight back. Women can wear their hair in a ponytail without the scars been shown. So a neck lift in this situation involves removing the fat from the front and the side of the neck, pulling the skin and the platysmal muscle back towards the ear, then removing the excess of skin. Then sutures or metal clips are used for suture up the incision behind the ear. If the patient has the two cords in the front of the neck and they can be sutured together, a platysmaplasty can be performed with the neck lift. An incision is made under the chin and the two muscular cords are sutured together and the front edge of the muscle is incised lower down in the neck. Then with an incision behind the ear, the platysmal muscle is pulled back very much creating a corset effect with the platysmal muscle. The excessive skin is then trimmed away and the incisions are all sutured up. Neck lift improves the excessive skin, the extra fat, and the platysmal cording very nicely and effectively. However, if the neck is still crépy, a laser technology needs to be performed to improve the skin’s quality. An ablative laser such as the Fraxel or the Pearl fractionated can be offered to smooth out the skin itself. However there is downtime with ablative laser technology. Another format does not use heat can be used to improve the skin’s quality. This is called PRP or Platelet Rich Plasma in which growth factors from the patient’s own blood is tapped into the neck skin creating a smoother skin surface. Three treatment sessions are needed, but there is no downtime and the changes will occur 3 to 6 months following the procedure. For the younger patients who have localized areas of fat in the front of their necks or under the jaw line, liposhaving is an excellent technique where the fat is nibbled and vacuumed away. Depending on the volume of fat, no skin tightening procedure is required as the skin is young enough to shrink by itself. The resulting contour becomes more natural. Some patients do not like narrow jaws where the angle is too soft. Some like the angle to be well defined giving a chiseled look. These implants are placed through the mouth outside the boney jaw and placed at the angle where they become locked in place. There may be more swelling with these implants and it may take 2 weeks to look socially acceptable. 4. Dark circles under the eyes are caused by many things. In an office setting, there is usually florescent light coming from the ceiling and therefore contour irregularities show up as darkness under the eye. In the lower eyelids there can be hollowing as in the tear trough depression that occurs commonly but can be extended laterally giving a hollow appearance to the eyes. There can be fullness in the lower eyelids and these are usually fat pads that protrude out. Any hollowing can be nicely corrected using a soft injectable filler like Juvederm Volbella made by Allergan. Usually two sessions are needed two weeks apart and usually one syringe is needed. When there are “bags” under the eyes, usually three pieces of fat that are pushing the lower eyelids out will require a surgical excision. Hyperpigmentation in the lower eyelid skin is one of the more common causes of dark circles under eyes. Pulling the lower eyelid inferiorly and watching the pigment descend onto the cheek can assess this. The brown patch is treated with a specialized prescription topical cream followed by limelight IPL. These can give a very dark appearance to the lower eyelids creating the phenomenon of dark circles under the eyes. This is nicely treated with a specialized laser on those veins in one or two treatments. Once the vein is gone the eyelid skin will look much brighter. 2. The skin can also be wrinkled or excessive. This would depend on the age of the patient. Medically speaking, an ablative laser is used to smooth out the wrinkled skin. If the skin is excessive, a surgical procedure would be performed to remove the excess of skin with an incision under the lash line that may extend laterally. 3. Bags under the eyes are a very common complaint from patients. There are two types of bags that occur under the skin. The more common is fat deposits that protrude as lumps and fullness in the lower eyelids. The less common bags are not actually in the lower eyelid but in the upper cheeks, these are called malar festoons. To remove the lower eyelid bags, surgery would be required. If the bags are small Dr. Ellis can use fillers to make them appear less obvious. If there is excessive skin, then an incision would be made under the eyelashes to remove some of the excessive of fat and skin. Malar festoons are a result of repetitive swelling or from natural hereditary conditions. Malar festoons are located on the cheek skin below the bony orbital margin. This can be improved through multiple progressive techniques. Initially when these festoons are small, injectable fillers can be used to augment the tissue around the festoons to make them less visible. The next stage would be to do needle liposuction to the cheek area under the eye. The final surgical technique would be an extended lower blepharoplasty or a mini-midrace lift to raise the sagging eye muscle. Dr. Ellis feels the best candidates to receive an eyelid surgery in his Toronto office may be of either gender, healthy, and have a sensible idea of what he can do for them. The common goal is to make the eyes look at good as possible. 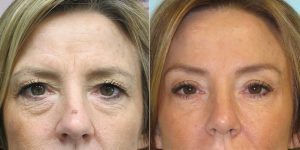 Eyelid surgery can be performed on an adult of any age, though Dr. Ellis’ patients tend to be thirty-five years and beyond. Eyelid surgery is minimally invasive, and commonly performed in Dr. Ellis’ operating room within his office, with the patient free to return home afterward. The cosmetic procedure may also take place in an outpatient surgical facility or a hospital, with regards to the comfort and discretion of the plastic surgeon. An eyelid surgery may take as little as one hour, or as many as three hours to wrap up the final stage of surgery. The type of anesthetic used will differ, and may be a sedation combined with a local anesthesia or general anesthesia. Post-operatively, our patients should be in the care of a responsible adult for the first twenty-four hours following the eyelid surgery. It may be difficult for an eyelid lift patient to see due to tearing, swelling, and a sensitivity to light. Other side effects of the surgery are eye irritation, tight skin around the area of surgery, and bruising. Usually a bandage is applied to the eyes following the eyelid surgery so they are protected and can heal in a sterile environment. Two days to one week after the eyelid surgery, Dr. Ellis or one of his staff members will remove the sutures, and you may return to work within the next few days. If it is deemed safe, makeup can be worn at this time to help conceal bruising. The swelling should subside in about two weeks, and may last up to a full month. As the swelling goes down, contact lenses may be worn. It is advisable to wait three full weeks after your eyelid surgery to strain your body or drink alcohol. Although precision and skill are used in every cosmetic facial surgery Dr. Ellis performs, there are still risks associated with any kind of surgery. Complications that may arise from the eyelid surgery are whiteheads, excessive bleeding, infection, dryness, an undesirable outcome, blurred vision, and very uncommonly blindness. A forehead lift, also known as a brow lift, is a surgical procedure designed to minimize the visible signs of aging in the forehead area and improve drooping eyebrows. By raising the eyebrows, the eyes become much brighter and bigger. It has been said that the eyebrows frame the eyes and define your face. Eyebrow position can naturally be low or may move downwards with aging such that the upper eyelids look heavy. People who can benefit from having their brows elevated can be as young as in their late twenties, up to and beyond their fifties. Forehead lifts are performed in Dr. Ellis accredited surgical facility under a combination of sedation and local anesthesia, usually as an outpatient surgery. Another option is for the forehead lift to be performed under total intravenous anesthesia, and an anesthesiologist must be present to administer the medication as well as monitor it. A forehead lift is performed in one to two hours, depending on how complicated the specific case deems to be. The majority of forehead lifts are performed endoscopically, which is a minimally invasive procedure using a camera to view the area underneath the skin. This produces less scarring as only 4 incisions are made away from the hair line. Forehead lifts are not only for women, and there is a special procedure that balding men can elect to undergo. Dr. Ellis can perform the surgery utilizing the upper eyelids to make his incisions leaving behind no visible scars. After the eyebrows are raised to the desired position and the skin on the forehead is tightened, a sterile bandage secures and protects the forehead. The rhinoplasty procedure is one of the most common cosmetic surgeries performed by facial plastic surgeons. The nose is located in the center of the face, therefore drawing more attention than other features. It can also be seen from many angles, unlike other facial features. Because many women tend to have their father’s nose, they feel it is too masculine for their more delicate features. Commonly, females come to Dr. Ellis requesting a reduction in the size of their nose, as well as a more delicate structure and tip as a part of their rhinoplasty. Men often prefer a less pronounced nose, or inversely a larger and less feminine version of their nasal anatomy. Generally, Caucasians have humps removed from their nose, and the bridges built closer to the face. Asian and African American patients seem to request the opposite in nose jobs, hoping for higher and more refined bridges. Although these are cases Dr. Ellis is frequented with, many other alterations can be made to the nose of a person of either gender and any race. Rhinoplasty surgery can drastically change one’s face or create minimal refinements, depending on the wishes of the patient. A person’s bone structure, skin, and other aspects of their anatomy also play a role in the unique differences made to the nose during this surgery. A rhinoplasty can be performed by Dr. Ellis using a choice of open procedure or a closed procedure. An open rhinoplasty is slightly more invasive and requires another incision to be made outside of the nose, on the underside of skin that connects the two nostrils. This technique is more commonly used as it allows Dr. Ellis more room to work. A minor scar may be present for a few months and slowly fades in time. A closed procedure does not require any external incisions. Dr. Ellis can discuss these rhinoplasty options with you at your consultation, and will inform you which procedure best suits your aesthetic needs. Potential changes to the nose during a rhinoplasty are briefly explained in the above section, however, there are numerous possible alterations that can be made. Virtually any aspect of the nose can be changed, from the bridge to the nostrils. The entire nose can be minimized or enlarged, the tip can be shaped and sized differently, the relationship between the nose and upper lip can be altered, and breathing problems can be fixed. Dr. Ellis feels that patients with good health and reasonable ideas of their surgical outcomes will benefit the greatest. It is in the best interest of the rhinoplasty recipient to be fully grown, or at least have completed their pubescent growth spurts which occur around age fifteen for girls, age seventeen for boy. The final outcome of the rhinoplasty can be altered by further physical maturation. The only scenario when it is appropriate for a child to receive a rhinoplasty is when the nose is crooked, or if the child has a deviated septum or other problems breathing. The side profile is an important aspect of the entire nose job surgery. Because the face should look balanced from all angles, it may be necessary to alter the appearance of the chin as well as the nose. It is common for rhinoplasty patients to also undergo a chin implant to create facial harmony and create the correct proportions when the face is looked at from the side. This concept is often easier to comprehend through a digital imaging session with Dr. Ellis. He will show you a combination of different noses and chins and how the angle between the two affect your face. 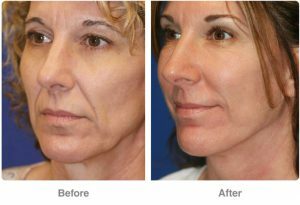 Although you may not require a chin implant, digital imaging also benefits those solely receiving a rhinoplasty, or another facial plastic surgery. A rhinoplasty surgery is performed on an outpatient basis in Dr.Ellis operating room under sedation and local or general anesthesia. A nose job can take as little as one hour to perform, but under certain circumstances may take longer. There is no need to remain hospitalized, but it is recommended that you have someone care for you for the first full day following your surgery. The anesthesia causes drowsiness, and your sinuses will feel congested. To avoid nosebleeds and discomfort, you will be advised not to bend over while standing up, or lift heavy objects for two weeks. A semi-hard cast will be placed on the nose to uphold its new shape, and packing may be inserted into the nostrils to collect excess blood and drainage in rare cases. Although some nasal procedures cause more pain than others, Dr. Ellis found in a study conducted by his office that one fourth of his patients did not take any medicine for pain following their rhinoplasty; pain medicine will be prescribed anyhow. Three to five days after the rhinoplasty, your cast will be removed. Bruising and swelling will occur, but this gradually disappears in the following weeks. Your nose will look much more normal about two weeks post-operatively. Drainage from the nose may occur for over a week after surgery, but since you shouldn’t blow your nose for two weeks, use a Q-tip to dab at it gently. The nose may feel stuffed for several weeks beyond your rhinoplasty. Exercise, sports, and the sun must be avoided for eight weeks, or two full months. Collapsed mid face with shrinkage of the cheek mound leads to a haggard drawn appearance. This starts to occur in the forties. It is corrected through a small incision in the upper gum line where a mid face implant is inserted giving a more youthful appearance to the cheeks. Recovery from this surgery is quick, and most patients can be socially acceptable in 2 weeks. High cheekbones are essential for good facial harmony and they give the face a nice attractive chiseled look. Flat cheekbones emphasize the fullness of the midface. If you wish you had the “high cheekbone” look as seen in many models, these implants will help. These are inserted through a small incision in the upper gum line and placed over the cheekbone to enlarge and raise the malar prominence. Recovery from this surgery is quick, and most patients can be socially acceptable within 1 week. Deep lip cheek grooves consist of a valley and a hill on the outside of the valley. The simplest technique to correct the problem is to insert Gore-Tex™ or other permanent fillers through the nose down the bottom of the valley, filling it in, making the groove less deep. A cheek mount lift can also be used to pull up the hill outside the groove. If there is no bruising patients recover within days. These depressions start at the corners of the mouth and make the mouth appear to turn down. The addition of a permanent 3-Dimension volume filler such as Gore-Tex™ or Alloderm™ is successful in decreasing the depth of the groove. Following surgery there is some swelling that settles quickly, but by 1 week patients look presentable. Fallen cheek mounds result in deep lip cheek grooves. Lifting the cheek mound is performed through an incision in front of the ear or beside the eye and the mound is lifted and repositioned in a more lateral and upward position thus lessening the depth of the groove. Sometimes Gore-Tex™ and other permanent fillers are inserted in the valley of the groove (See lip cheek grooves). Some patients have weak chins that need to be moved forward to give a stronger chin profile. The insertion of a wrap around implant can project the chin and give it some width so that it does not become too pointy. The implant is inserted with a tiny incision under the chin. Patients recover within 2 weeks. With aging, ear lobes become too big. Ear lobe reduction is most often performed at the same time as a facelift surgery, but can be performed as an isolated single procedure. Recovery is quick with minimal bruising. More About Protruding Ear Correction A protruding ear treatment is ideal for younger individuals as well as older because it involves very slight discomfort and is a safe procedure for all ages. Although this cosmetic surgery is safe for children, there are some stipulations to receiving a protruding ear treatment. Potential patients should have the intent to lessen the look of protruding ears, be healthy, and have realistic goals for their surgical outcome. Parents should prepare their children for the surgery and the healing process that follows. Generally performed on an outpatient basis in the surgical facility of a hospital, surgery center, or plastic surgeon’s office, a protruding ear correction can take two to three hours to undergo. A more extensive operation may require more time. If the patient is a child, general anesthesia is more common, while adults are usually administered sedation and local anesthesia. A large bandage is placed over the surgical site after the corrective cosmetic procedure, and is exchanged with a headband a few days later. It is normal for a patient to experience aching or throbbing of the ears following a protruding ear correction, and pain medicine can minimize the discomfort. Other possible side effects are temporary swelling, a lack of sensation, and redness of the area. Sutures are removed within a week unless they are dissolvable stitches which do not require more care from a plastic surgeon. School and work may be returned to in five to seven days after the surgery. Any activity that requires physical exertion should be postpones for one to two month. If the patient plays a sport or does an activity that may bend the ear, they should refrain from them for a month or longer. Accompanying the protruding ear surgical treatment are possible risks of infection, noticeable scarring, hematoma, an asymmetrical or unrealistic look, the requirement for another surgery, and recurring protrusion of the ears.